As I write this, it is the anniversary of the attack on the World Trade Center. 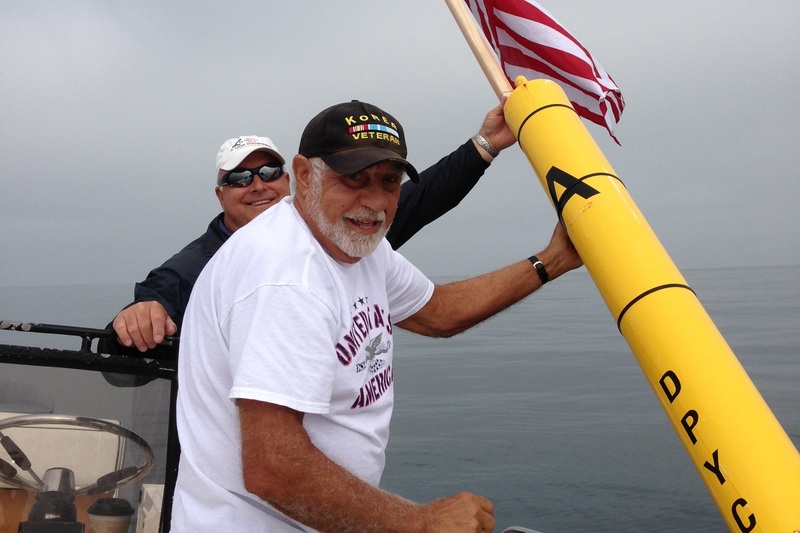 One year after that happened, Chris Anastasio, a Dana Point resident, veteran and patriot, thought it would be nice to see the American flag flying on a “post” offshore. He didn’t know what that post was at the time, but after he kayaked out to put the flag on it, he learned that it was “A Mark”—one of the race markers for Dana Point and Dana West Yacht Clubs. Every week, it is rounded by competitive (and recreational) sailors, so it is quite visible. It can be seen from shore with binoculars or very good eyesight. Every few months, when the flag gets faded or tattered, Chris has kayaked out to replace it with a new one. Don DeNault of DeNault’s Hardware in San Juan Capistrano, donates these flags to the cause. Racers love it because it makes the mark visible from a greater distance. I love it because it looks so cool to see a flag flying on the ocean. Chris has found new friends at the Dana Point Yacht Club who take him out in a Boston Whaler now, which makes it much easier, and faster, to replace the flag. Recently, something caused the flag to disappear. It looks like a large boat hit the mark and knocked the pole and flag off. There is a dent in the yellow mark that would indicate a collision. I was lucky to be invited to go out with Chris and with David Bolton, who drove one of the DPYC mark-set boats and helped replace the flag. It was a day like I have never seen on the ocean. Not a ripple could be seen and the sky was slightly overcast, giving an eerie vibe to the morning. I half expected to see the creature from Jaws surfacing next to us for breakfast. As you can see in the photo, it takes a little planning, strength and know-how to replace the flag, but what a lovely sight it is when the task is finished. 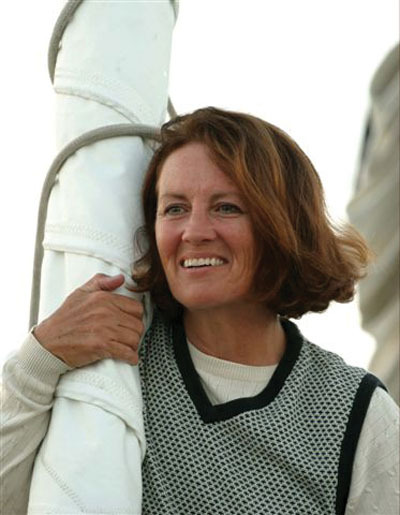 Barbara Merriman is a former public school music teacher with a love for outdoor sports, primarily sailing and golf. She keeps a sailboat at Dana Point Harbor, has a passion for protecting the environment and serves on the Board of Directors at the Ocean Institute. In an effort to provide our readers with a wide variety of opinions from our community, the DP Times provides Guest Opinion opportunities in which selected columnists’ opinions are shared. The opinions expressed in these columns are entirely those of the columnist alone and do not reflect those of the DP Times or Picket Fence Media. 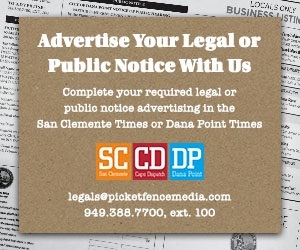 If you would like to respond to this column, please email us at editorial@danapointtimes.com.